Since I first saw it at the pictures all those years ago Ghostbusters has long been one of my favourite films, so I was pretty excited when my Dad came home one day after a visit to the video library with a box marked “The Real Ghostbusters”. Â This particularly video library always gave you the tapes in boxes that just had their logo and the video title written on in felt tip pen, so I was even more curious about what this might turn out to be. I popped the tape in the video recorder and up came two episodes of a well animated TV cartoon series featuring Dr. Pete Venkman, Dr. Ray Stantz, Dr. Egon Spengler and Winston Zeddemore. Â The characters were pretty much the same as in the film in terms of their character, but they didn’t exactly look much like the original actors, so in order to help tell the difference between them each team member wore a different coloured uniform. 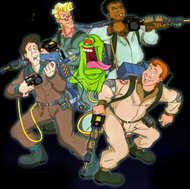 Funnily enough, this lack of looking like the Bill Murray, Dan Aykroyd and the other members of the film cast was used as a joke in one episode, which explained the Ghostbusters film as being a film made about the exploits of the cartoon gang, with the animated Ghostbusters acting as advisors to the film makers. Â The cartoon Venkman proclaims that the actors don’t look anything like them, and also uses the name of the cartoon as part of the joke, as he refers to the cartoon Ghostbusters as being the real ones. Going back to the rented tape, I forget the second episode on the tape now, but I’m pretty sure the first episode was entitled “Knock, Knock“, and was a continuation of the story of Zuul and closing the gates to her dimension from the film. Â Of course I lapped this up, and couldn’t wait to see more, despite really being probably a little too old for cartoons really at this time (but hey, you’re never really too old for cartoons!). A few months later the show started airing weekly on Children’s ITV, and it was surprising how much the film and cartoon shared. Â The Stay Puft Marshmallow man put in the odd appearance, as did Walter Peck, the city official who closes the Ghostbusters down in the film. Â In an attempt to make the cartoon series a little more kiddie friendly Slimer the ghost from the films had joined the Ghostbusters crew and helped (hindered) them in their job to rid New York of spooks and spectres. Despite this however, the series still retained a fairly dark overtone at times, thanks in part to the head writer on the series being J. Michael Straczynski, creator of cool sci-fi show Babylon 5. One thing I puzzled over at the time was why the series was called The Real Ghostbusters, and thanks to the Internet I now know the reason why. Â Turns out that in the mid 1970’s there was a TV series called The Ghost Busters made by Filmation (better known for He-Man and the Masters of the Universe). Â This was a live action show in which two bumbling men and a Gorilla called Tracy (I kid you not) tackled various ghosts and ghouls. Â When the Ghostbusters film was used Filmation gave Columbia permission to use the name, but when the film became a smash Filmation decided to reprise their old show in animated form. Â This was in 1986, the same time as the cartoon based on the film started production, so in order to avoid confusion this becames known as The Real Ghostbusters, whilst the Filmation series is just Ghostbusters. Â Didn’t really stop the confusion, did it? Anyway, going back to The Real Ghostbusters itself, the show started in 1986, and in 1988 was renamed Slimer and the Real Ghostbusters, with Slimer being given stories where he had much more of a starring role alongside more standard Real Ghostbusters fare. Â In 1991 when viewing figures began to decline the series was cancelled, but in 1996 a relaunch was attempted with Extreme Ghostbusters, with Egon, Janine and Slimer teaching a new group of Ghostbusters the tricks of the trade. Some good news for those of you who are big fans of the show is that Time Life are planning a US release of the entire series on DVD. Â Coming in at a hefty 25 (yes 25!) discs it contains all 147 episodes of The Real Ghostbusters and Slimer and the Real Ghostbusters, and has more than 12 hours of extra footage to keep a real fan thoroughly entertained for a long long time. Â For more information and to pre-order a copy pay a visit to the www.realghostbustersdvd.com website. Â No news on whether a UK release is planned, but it sounds like a great box set! This entry is filed under TV - Cartoons	and was posted on October 14th, 2008. You can follow any responses to this entry through the RSS 2.0 feed. You can leave a response, or trackback from your own site. Did you spot who voiced Egon ? And who one of the storyeditors was ? Yes indeed, Maurice LaMarche, voice of Kif Kroker, Calculon and the excellent Morbo from Futurama. Apparently he was also the voice of Sylar in an early episode of Heroes, before Zachary Quinto got the role. As to the storyeditor, I assume you’re referring to JMS, as I mentioned… :-b or was there somebody else I missed? I missed where you said it. D’oh.